The mouse plant (Ochna serrulata), also called a Mickey Mouse plant, is actually a shrub native to South Africa. It grows from 4 to 6 feet tall and has attractive yellow flowers reminiscent of wild rose bush blossoms. 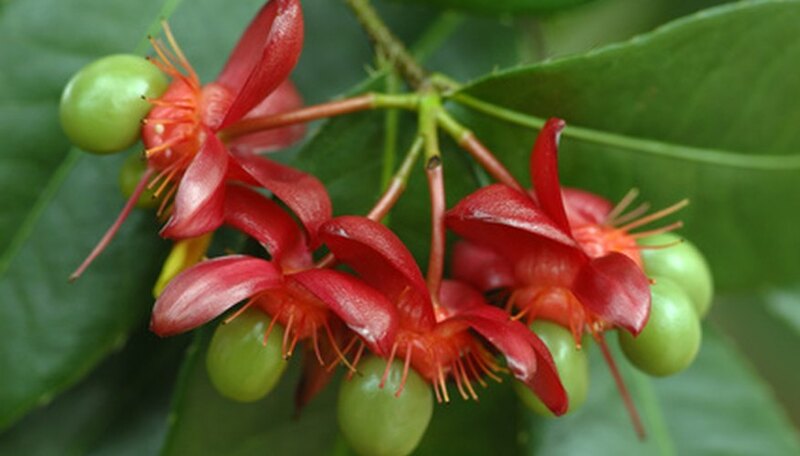 The flowers are followed by dark colored fruits that develop below red sepals, causing the plant to resemble the face of Mickey Mouse. The mouse plant cannot survive temperatures that dip below 50 degrees F, so it's best grown as a houseplant in most regions. Fill a growing container three-fourths of the way with potting soil. It is important that the chosen container have drainage holes in the bottom to prevent overwatering. Place the root ball of the mouse plant into the soil at the same level it was growing in its original container. Replace the soil and pat down firmly to remove air pockets. Water until the soil feels moist, but not soggy, and place the container in a location that receives muted sunlight. Check the soil regularly and add water whenever it no longer sticks to your finger. Fertilize every other week with a water-soluble fertilizer. Do not feed the mouse plant during fall and winter to allow it to become dormant. Wait one or two weeks after planting before you begin to fertilize the mouse plant. The mouse plant can be grown from seeds or cuttings.